A vintage dessert that, you guessed it, only takes 30 minutes to bake. You may remember Grandma making Half-Hour Pudding! It’s a classic recipe that has been passed down from generation to generation. I can’t remember when I first tried Half-Hour Pudding. It may have been at my Grandmother’s house when I was a child. She was always baking up sweet treats. I miss her recipes and her company dearly. When you find a recipe from grandma, you know it’s a keeper. 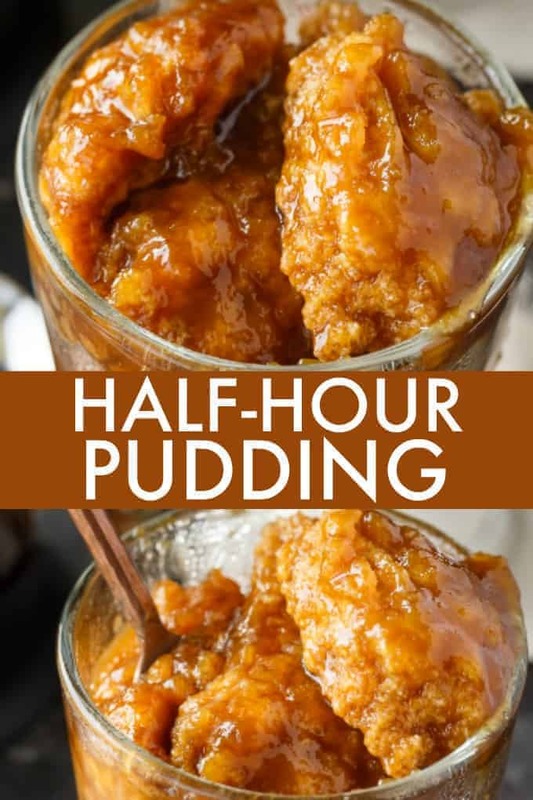 So what is Half-Hour Pudding? 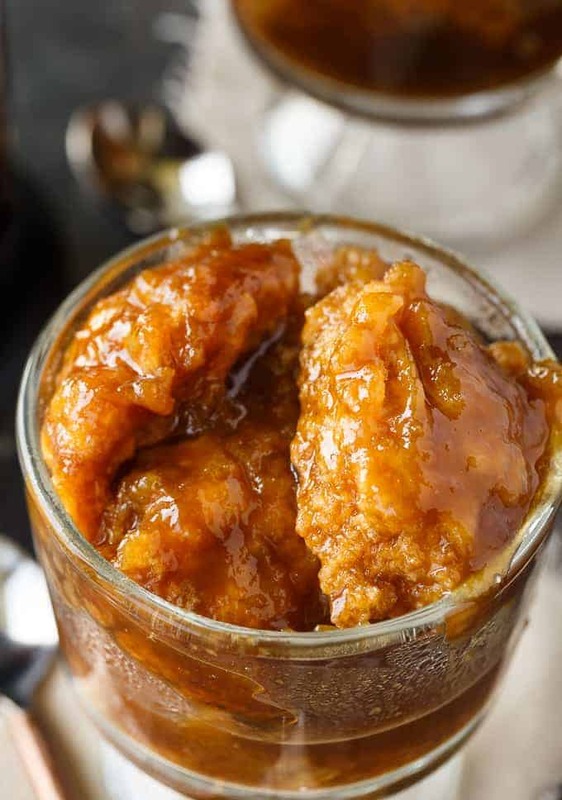 It’s basically a sweet bread pudding baked in a rich caramel sauce. If you have a sweet tooth, you are going to want to print this recipe below. 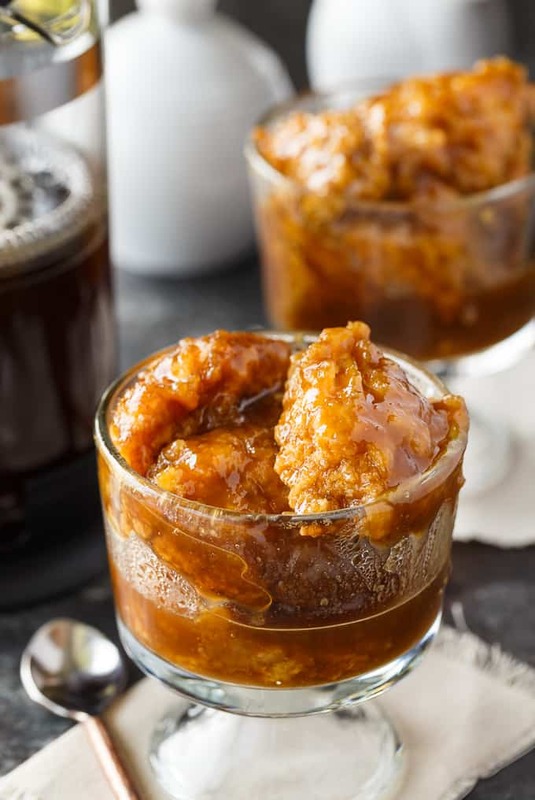 I think one of the reasons I love this recipe is my obsession with caramel. Give me caramel over chocolate any day. I love the sweetness, the silkiness and how smooth it tastes on your tongue. I’m going to warn you, it’s sugary! First, you’ll make the cake part of the recipe by stirring the brown sugar, milk, flour and baking powder into a large bowl. Set aside for later. 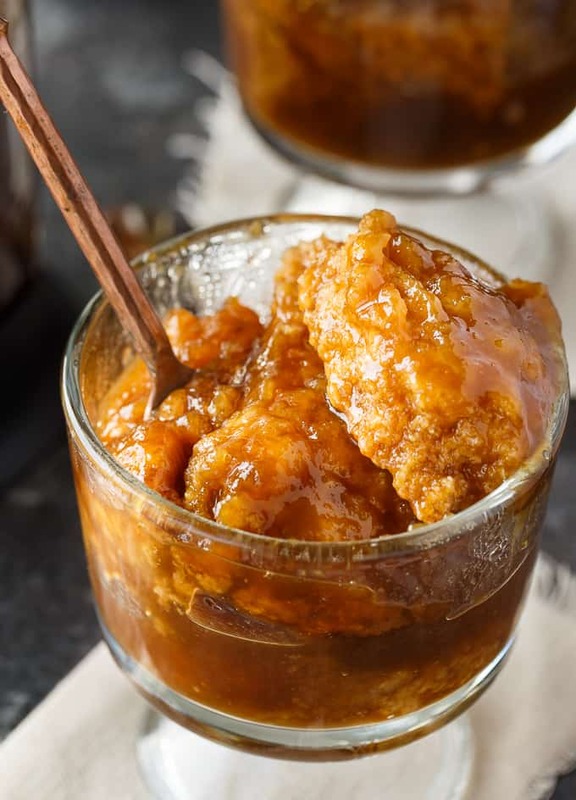 Next comes my favourite part – the luscious caramel sauce. Bring the water to a boil on the stove. Stir in brown sugar and butter. Boil for 5 minutes. 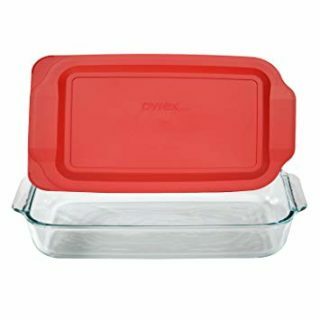 Pour the sauce into a 9×13 baking pan. Top with the cake batter. Don’t worry if it’s not perfect. It’s better this way. Bake for 30 minutes and serve! 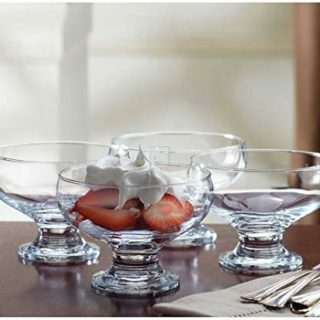 I serve this dessert in parfait dishes filled to the brim. We all love this easy dessert! Every time I make this recipe, I remember Grandma. I hope you’ll give it a try and share it with your family too! For more vintage desserts, check out Fruit Cocktail Cake, Cracker Pudding and Wacky Cake. An easy vintage dessert recipe just like Grandma used to make. 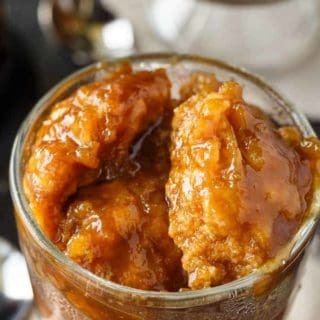 The sweet bread pudding bakes in a rich caramel sauce for 30 minutes. Stir together cake ingredients in a large bowl. Set aside. Bring water to a boil on the stove. Add in brown sugar and butter and stir. Boil for 5 minutes. Pour sauce into a 9x13 baking pan. Top with cake batter mixture. Bake for 30 minutes. Oh my looks delicious! Actually it looks just like an old dessert my grandmother (and many other Quebec grandmothers I’m sure) used to make, we called it “pudding chomeur” roughly translated to poor man’s pudding. My favourite! 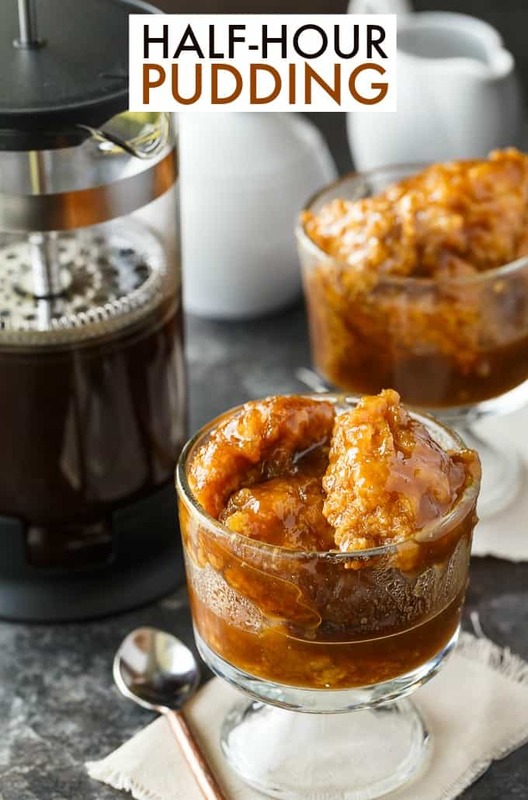 This looks so fun and tasty, and perfect for fall! Thank you for sharing at Celebrate It! We love pudding and this looks delicious and so comforting! Thanks so much for sharing with Full Plate Thursday and have a great week! Looks and sounds so yummy Stacie! Sharing! Thank you for sharing on Merry Monday! Hope to see ya next week! 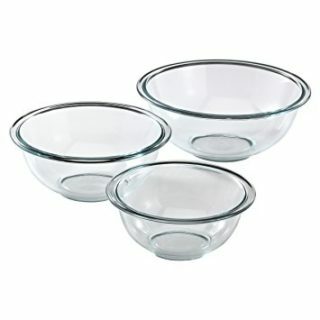 Thank you for sharing recipes. For the sauce, is it 2 teaspoons butter or 2 tablespoons? Just making sure I have correct amount before starting. Take care!